From the moment of arrival Alberta’s grandeur and beauty are obvious. Rolling foothills, intimidating mountains and prehistoric hoodoos are a few of Alberta’s more distinct natural landmarks. 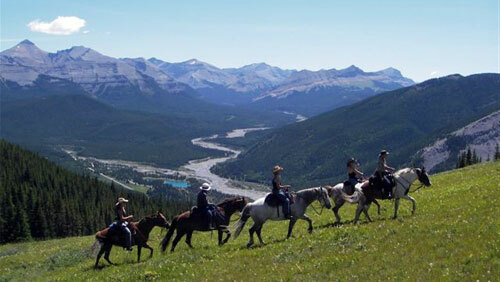 Horse riding holidays in Alberta are many and varied. In Banff you can enjoy horse riding in the Canadian Rockies and Banff National Park on our Banff Tenting Ride and Banff Lodge Ride. Explore the Kananaskis area on our Continental Divide Ride. Most impressive are Alberta’s Rocky Mountains and Kananaskis Country, which facilitate the world famous resort towns of Banff, Jasper, Canmore, Kananaskis, Lake Louise and Waterton. Dinosaur hunters flock to Drumheller, home of the acclaimed Royal Tyrrell Museum of Paleontology, where the desert topography yields countless fossils and prehistoric discoveries. Alberta’s rural heritage can be further explored with a visit to the vast farmlands of Alberta’s Heartland, Southern Alberta and Northern Alberta. Calgary, home of the globally recognized Calgary Stampede is best known for its warm hospitality and close proximity to the Rockies.